Views From the Lamb's Herd: June is almost over? The first week of the month had the last week of school. Even though it was after finals, I was still making my students work, but not as hard as I do during the school year. I asked my Trig class to fill out an online survey about how they felt I did as a teacher. I got high marks on using technology, although I don't feel I used it as much as I could have in this upper level math course. I do much better at integrating tech in lower level classes, as it helps with motivation. So I know I need to work on that. Hopefully, using cell phones in my Advanced Algebra classes next year will do that. (I'll be looking for ideas on how to do this at NECC next week.) At the end of the first week was graduation. I have to say that I absolutely LOVED our valedictorian's speech, even in 99% of the people at graduation did not understand it. He spoke about inspiration, and it was presented as if it were a mathematical proof. I would love to have a copy of it. The following week was full of professional development. On Monday we reflected on our day with Ken O'Connor. You can access the live blog of our original day here. We ended up not doing a lot of direct reflection on grading policies, but I believe that we opened a lot of discussion that was necessary to help with the morale of our staff. It is nice to be able to have days like this. 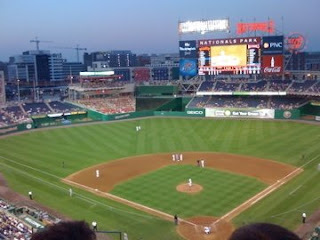 As soon as that day was over, I hopped in my car and headed to Washington, D.C. to see the San Francisco Giants beat the Washington Nationals (4-game sweep!). Here is the view from my seat. The rest of the week had me meeting with our math department and facilitating the second CFF course and showing teachers about the TED Talks and Skype (My Skype name is jimbo.lamb). Following these session, I began a two week tour of duty at Camp Kaleidoscope as a substitute counselor. This was awesome, as it gave me a chance to work with elementary and middle school aged kids. I'm going to miss the camp, as I might not get any more hours there this summer. The big event for me was when I was on WITF's Smart Talk. I was asked to be on the show as part of a panel of teachers (which ended up being just two of us, as one was unable to appear) to talk about some of the issues that face education today. I was joined by Rich Askey, President of Harrisburg Education Association and music teacher. Among the things we talked about were what teachers do in the summer, how NCLB has changed the classroom, and a brief discussion on technology in education. I think I amazed host Nell Abom when I rattled off my list of what I am doing this summer (attending and running numerous professional development sessions, working two part-time jobs, finishing grad school, revisiting the curriculum for my classes, working on ways to integrate cell phones in my instruction, attending NECC and PSEA's Leadership Conference, hopefully holding open fields for soccer, and many more things). I was glad to have been able to add in some info on CFF, but our time was cut short by the previous segment on the economy. The producers of the show are hoping to have us back on the show in the fall, after the school year begins. I look forward to being on again and sharing what I know about education. Now I am preparing for NECC. I leave from Philly early Saturday morning and will be staying at the Homewood Suites on the Riverwalk. I am hoping to live blog a few sessions from San Antonio, but I still haven't decided which shows I will be attending live and which ones I will review through other blogs. I do have to say that I am quite impressed and happy with the use of tags for sessions. I hope that those of you who aren't attending are taking full advantage of the blogosphere. And with that, I will be drawing June to a close. I will be blogging as best as I can at NECC, and when I return to PA it will be July! Where does the summer go?